Believe Santa w/ Pack on Back Handpainted Needlepoint Canvas by M. My goal is to offer you the finest hand painted needlepoint canvases, needlepoint accessories, stitching supplies and the best professional services. Offered for sale is a Gorgeous hand painted large canvas, titled "Believe Santa on Roof", from Mary Engelbreit. Hand painted, with so much detail, on 18 mesh mono canvas. The painted canvas design area is approx. 10" by 8.5", with surrounding canvas of approx. 14.25" by 12.75". Sorry for the shadow on the lower edge of the picture! This is an extremely detailed piece with a beautiful colors and shading. Canvas would be a perfect framed piece, an Insert, a pillow with background stitched. For so many more wonderful offerings!!! Get Images that Make Supersized Seem Small. Auctiva's Listing Templates improve your auctions in minutes. Attention Sellers - Get Templates Image Hosting, Scheduling at Auctiva. 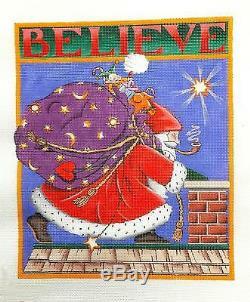 Believe Santa with Pack on Back Handpainted Needlepoint Canvas by M. Engelbreit" is in sale since Saturday, December 24, 2016. This item is in the category "Crafts\Needlecrafts & Yarn\Embroidery & Cross Stitch\Hand Embroidery Cloth & Canvas\Plastic Canvas". The seller is "cashaw47" and is located in Plattsburgh, New York.